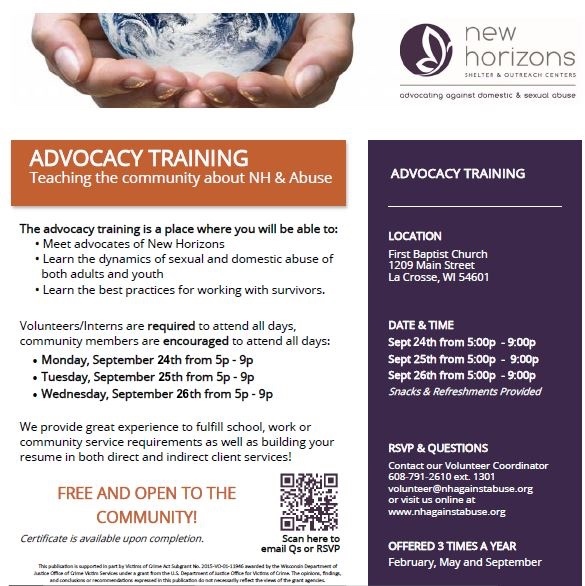 New Horizons holds Advocacy Training three times each year–in February, May, and September to provide an opportunity for members of the community to learn about New Horizons and abuse. Training sessions take place over the course of three consecutive evenings and are free to attend. Volunteers and interns are required to attend all days. Community members are encouraged to attend all days. To register for the session, or if you have any questions–contact Maddie at (608)791-2610, ext. 1301, or email her at volunteer@nhagainstabuse.org.